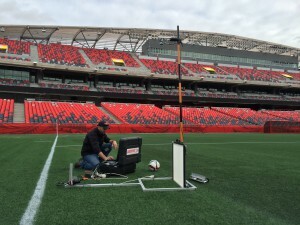 Labosport Canada tested training and competition fields in East Canada for their performance and aesthetic qualities. 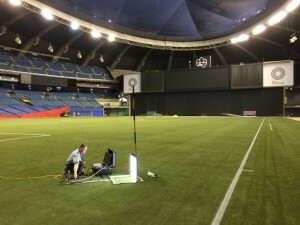 We used the new imaging software by Labosport R&D teams to measure infill dispersion of artificial turf prior to FIFA women’s world cup games. The dispersion of rubber infill occurs on ball rebound or when a player slides on the surface. Little or no splash means a better viewer’s experience, so the test helps measure broadcast quality with the objective of no visible difference to natural grass. Our imaging software captures and analyses infill material motion with high frequency and high resolution. 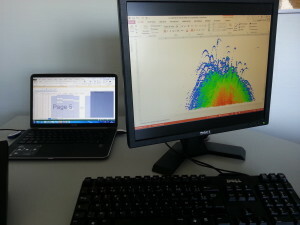 This data is then computed into an index, allowing to judge the product behavior. With this information, Manufacturers and architects can design better artificial grass for football, soccer or also baseball and softball, where catchers want low splash and a surface with the correct speed and ball bounce behavior.